We humans have a peculiar relationship with robots. On the one hand, we create them, and they amaze us with their awesomeness. On the other, well, have you ever heard of a little thing called Terminator? In few instances is our love-hate relationship with our mechanical brethren so fully realized as in this video (below) of a swarm of “nano quadrotors” performing advanced maneuvers. The whole thing is both amazing and chilling, all at once. 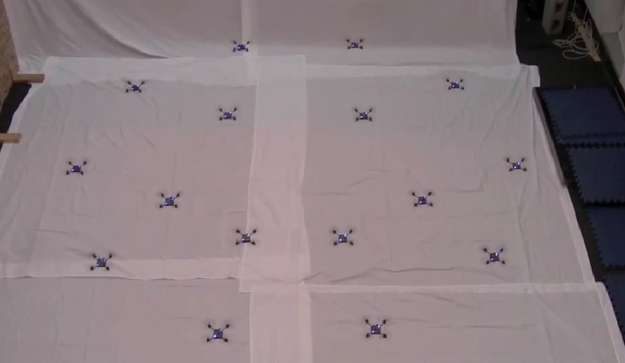 The tiny flying robots were developed by KMel Robotics, and the coordination system, which allows the 16 quadrotors to flip, spin, and gather into complex formations, was created by a team of researchers at the University of Pennsylvania’s General Robotics, Automation, Sensing, and Perception (GRASP) laboratory. Of course, this is far from the first time we’ve seen similar robots doing amazing things. (A quadtrotor playing real-life Pong, anyone?) But it is the first time we’ve seen them moving in such a sophisticated, militaristic-like fashion.